But I like my country as well. Simple pleasures of apple trees, berries of all kinds... fighting bees for any of those berries, fighting ants for my strawberries, fighting flies for my compost... So much fighting and yet I love it here. Ante, what do you do for living? Are you a hotelier? Liquor maker? Something else? Im electrican , lineman. My familly makes liquers, soaps, all kind of crafts for tourist. We also have lot of olives for making olive oil. Im specialist in 10 000 volts systems. Something like that. I do mostly swiching gear, cable connections, poles, trafo exchanges.... And best thing in my work is FIELD work. No offices , every day in another place. i wish they all speak so good english like you Jack. Its easyer 2 help them. i have a 24/24 duty every 3 weeks. I help them like i woud be helpt in a other country. I once got 700V in a practical lesson, my tutors fault, he lost his license, he told me to touch it as a punishment for defying his authority. I didn't know where I was, once they switched it off. Few miliseconds caused me a week of headache and minor burns on the cuticles (soft finger tissue). Considering, that I play accordion, that was terrible. For 3 months I couldn't touch my instrument, any touch with it's material was painful. Actually, Slovaks who work as truck drivers are something terrible. They are literally pirates on the wheels back in our speedways. 24/24 is pretty tough, but at least your job is now, in the crisis time, always needed. You should have seen their faces, a guy out of nowhere just repaired their car, said goodbye and went away. They wanted to give him money, but he refused. "I helped you just as I believe you would help me, if I had problems in your country..."
cu guys end tell me al the news when im back next week. Will do! Just drive safely. Jack, are you going to plant them out in a heated green house? I have tried to grow musa williams, cardaba (also a philippine cultivar like saba, and very similar, but a bit smaller), mahoi, thousend fingers, ice cream and many others. But The only way to have fruits in our clime is to grow them in a heated greenhouse or in pots. And for that they need to be dwarfs. Bananas like saba reach very huge dimensions. They need a green house at least 8 - 10 Meters high! Even a williams hybrid needs 4 - 5 Meters included the leaves! I think rajapuri, dwarf brazilian, dwarf orinoco are some of the hardiest dwarfs that are not too big for to keep in pots. Here are two pictures of a saba in the Philippines. It is in the province of my wife. They are big enough that you can climb on it! Well, I thought a lot about potting, that's what I have most of my Dwarf variants for. But here's my new theory (to be tested this winter and next spring). According to my experience (and that of others as well), Dwarf cultivars (or any growing to 2.3m) can be stored in pots and fruit large bunches in 100 L pots. The problem there is is with the pots themselves, because potted plants grow much slower than those in the soil. A combination of potting and free land growing might be necessary. Based on what I have read in Frank's post about overwintering in zone 7a, I'm positive that I could extend the period for their growth by another month in my climate (from late March/early April to early November or so), giving them temperatures of maybe 16 degrees. And I have a smaller greenhouse, that is effective in the spring. Winter/Spring: The spring comes here a little later than it does in say Mediterranean region, but this can be efficiently compensated by that greenhouse I mentioned before. Not only, that it can effectively extend the growth period, but also could possibly eliminate the danger of sudden late frosts that tend to destroy lots of the harvest sometimes. Plants would be potted and thus could start growing. Than in late April or early May the plants would (in full growth) go into the garden and soil (special large pots might be necessary, I even cosider creating special wooden boxes or making special extra large ceramic pots, because the plant that has grown freely once will never want to go to small pot again. Other alternative is to use polyplastic root materials, that will be wrapped all over the roots, hold the soil, bet let the water in and out - just like those you can see, when you buy young trees). Sumer and Autumn: The first problem comes with last October or early November days, as the first freeze could occur anytime. Therefore I will move the plants to the greenhouse and there, under controlled conditions I will lower the temperatures to make them dormant. Dormant plants will be stored in the garage. The key factor is, that the plant's adult height mustn't be more than 3,5 to 4 meters. It would become really difficult to work with. So Saba is out of the question for that matter (although I might try my theory with larger pieces too). I also carefully choose the cultivars, they must be in the level of superb cold hardiness and have height to certain levels. So far, according to papers, this could be done with about 30 to 40 different cultivars. I will try something out and by the time of winter, the plan will be complete. I will also share my progress with you. The only problem that I haven't quite figured out is, what if the plant starts blooming too late? The whole extraction and overwintering procedure will get delicate and must be done precisely. Wow, these Sabas are real monsters! Think I ll stick to dwarfs. I have always been reading Franks posts about his winter storage. In fact it was my motivation to store them bare rooted in the cool basement through winter. Just like many american banana lovers do, where they have warm weather for 7 or 8 month and then a not so cold winter with frosty nights for the rest of the year. I have found out that the growth in our clime is not comparable with the growth in the states. Our average temperature in the growing season, is never as high as in the states, which pushes bananas into fast growth. Here is already august when the ground has warmed up to the temperature the bananas like! In the states that happens in June! The only exception was 2003. Then my garden looked like a jungle already in the middle of July. The other and maybe the main reason that it takes so long for the bananas to get going is, the perma frost and cold average winter temperature, causes a very long time to warm up the soil. 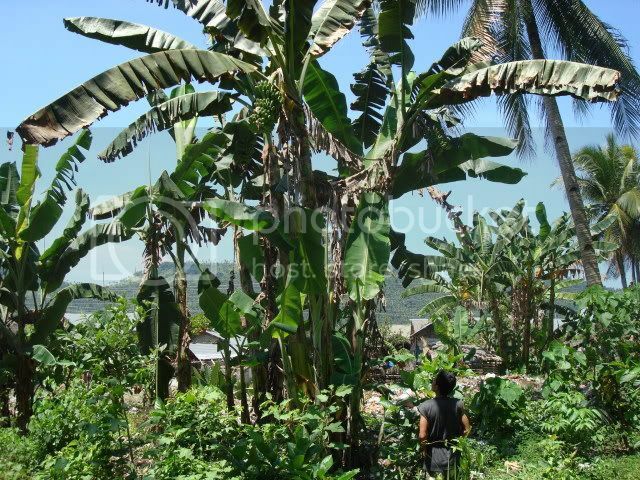 All in all, the bananas can not make enough strength in summer to get through the dark, cold and long winter time. Me personally cut down the amount of different cultivars. I planted a dwarf brazilian and a dwarf orinoco out in my garden in iron baskets, they are easy to take out without disturbing the roots too much. Beside them I have a musa sp. yangtse that I also put in the ground to over winter like musa basjoo. Me personally cut down the amount of different cultivars. I planted a dwarf brazilian and a dwarf orinoco out in my garden in iron baskets, they are easy to take out without disturbing the roots to much. Beside them I have a musa sp. yangtse that I also put in the ground to over winter like musa basjoo. Interesting. I live in the lowland, the temperatures are extreme here (for the region), also, I get very little rain, that could cool the soil. My region also belongs to a very distinct part of Central Europe, because there are incredibly large natural water reservoirs and they do keep the warmth well (up to +6°C in the winter, when compared to the rest of the Slovakia). It is also the fact, that typical crops of USA in the zone 7 (corn...) grow here like weed, the problem usually is to get rid of them, not to grow them. I think the soil temperatures in Switzerland might be a result of surrounding mountain system. The rocks (microclimate element) usually heat up slowly, but then they remain hot for a longer period. However, the water is much better heat leader. These are some of my hopes and estimates, that the bananas will like it here quite a lot (based on seeing what grows in USA and here). Well, I will see, but thanks for the warning. I will make it so, that even if some bananas do not survive the winter in the storage, I'll have enough pups to keep on going. You might have just as well saved me another year of searching, thanks. Talking about heat, four older peoples died in Croatia today because of heat wave and high air pressure! Isnt good. Today, I poured in my garden more than 2000 litres of water, it practically ran the better part of the day. Lucky me, there's so much of it below me, that it was for free.